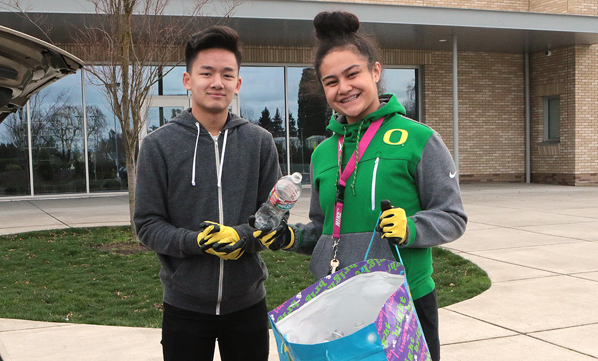 In outer East Portland, here – picking up a sack of donated, deposit-return bottles and cans – are Parkrose High Key Club members Matthew Ngo and Lola Moeaki. 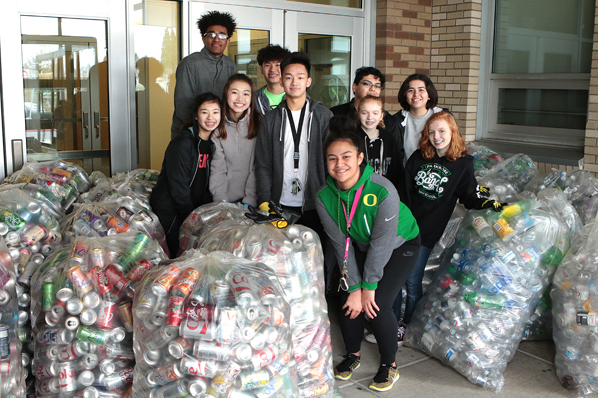 For years the Parkrose High “Bronco Boosters” have raised money for scholarships – and especially their Senior All-Night Party – by collecting and redeeming deposit-return bottles and cans during a monthly drive. 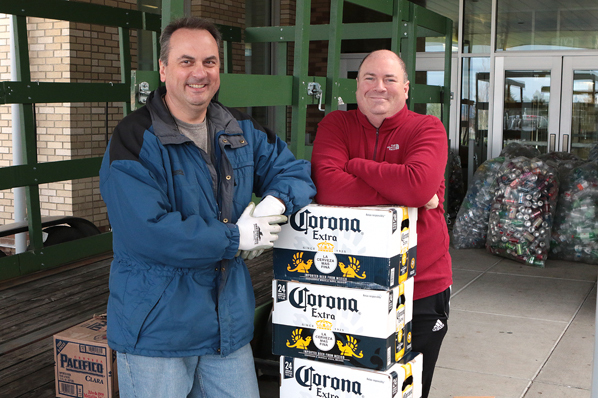 But, with deposit-return redemption rates doubled from a nickel to a dime each, fewer folks have been coming by to donated, sighed volunteer Tim Sepich at the February 3 drive. Many hands make for light work at the monthly Parkrose Bronco Boosters bottle and can drive. 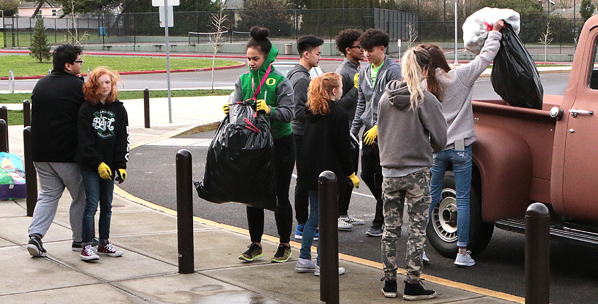 “Not only does our can drive support our Senior All-Night Party, it also supports many of the groups at the school – such as choir, band, sports, and – like today – the Parkrose High Key Club; in fact, nine groups a year pitch in to help out, and each one when they do gets a portion of the proceeds,” Sepich told East Portland News. Long-time volunteer Greg Meighen spends a moment with volunteer Tim Sepich. These members of the Parkrose High Key Club will benefit, receiving some of the proceeds of this month’s bottle and can drive. From 9 a.m. to 1:00 p.m., on Saturday, March 3, bring your deposit-return cans and bottles with you to help support these community educational efforts. The drive will be at the Parkrose Middle School front entrance, at 11800 NE Shaver Street, 97220. For information, contact volunteer Tim Sepich at puckmonkey@comcast.net.